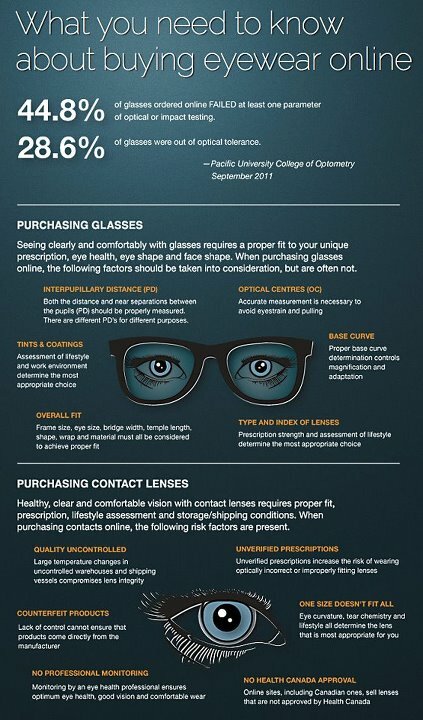 Researchers from Pacific University published a study in 2011 that tested glasses purchased on-line for compliance of optical and safety requirements. Of the 154 pairs of glasses purchased from the top ten U.S. online spectacle vendors, almost half of them failed at least one parameter of testing. Staff at my clinic have reported many people comming in with glasses bought online that have numerous problems. Some are funny, like the kids who walk in with glasses that are way to big for them. Their parents want them adjusted so that they fit properly but that is not possible since the frames so big should never be sold to a child. It is often no consolation that in 5 or 6 years the child may grow into the giant frames. Others have headaches from lenses that do not align properly with their eyes. Some people have progressives that are unusable because no one explained to them the best lens choice for their vision and lifestyle. The list goes on.